LONG before the GPS was invented, bees learnt how to navigate the shortest possible route when they buzz from flower to flower. British researchers have attached tracking devices to the backs of bumblebees – which live for about a month – and found that they use trial and error to determine the ideal flight path from one food source to another. Developing an efficient route between scattered feeding sites – to save both time and energy – is the goal of many species including ants, bats and hummingbirds. But scientists have struggled to understand how animals achieve this feat in the wild. “[It’s] analogous to the well-known travelling salesman problem – finding the shortest route to visit a set of locations once and return to the origin,” the study leader, Lars Chittka, said. The London psychologist from Queen Mary University and his team arranged five artificial flowers, each filled with a few drops of sugar and fitted with motion-sensor cameras, 50 metres apart on an open field to prevent the insects navigating the shortest distance by sight. 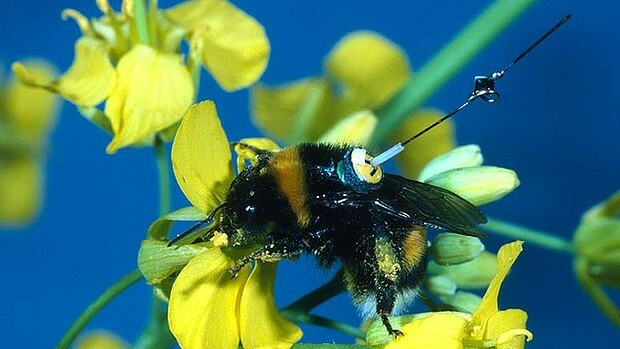 They also attached tiny transponders on the backs of five bees to track them as they foraged for food. When released from their hive, all bees found the closest flower first. After several foraging trips they found the other sites. Between their first and last attempts, the bees reduced their travel distance about 80 per cent, from 1953 metres to 458 metres, in one day. Measured by a computer, the shortest path was 314 metres. Of the 120 possible routes between the five flowers and the nest, the bees tried only 20, on average, before finding the shortest. Because it takes too much time for the bees to explore all the possible routes between food sources, the team suggests that the insects learn the best flight path through experience, abandoning a previous route if they happened upon a new, shorter path. On average, it took the bees 26 trips to figure out the ideal journey. While the researchers were surprised how quickly the bees could find the best route, given the number of possible solutions, their technique was “simple and elegant”. “It sounds simple to keep exploring even when you’ve found what looks like a good solution and, if you do find a new route, compare it with your previous one and then stick with the better of the two – but it’s robust and it works for an animal with a brain the size of a pinhead,” said Professor Chittka, whose findings were published in the journal PloS Biology. When the researchers moved one flower to another location the bees’ distance increased before they incorporated the new location into their ideal circuit.